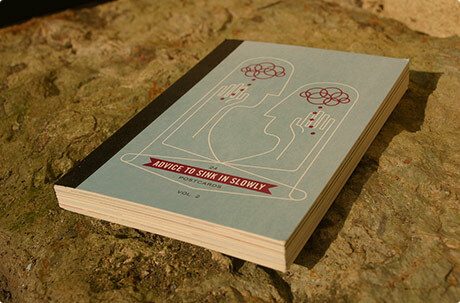 Advice to sink in slowly is a collection of 24 postcards passing on personal advice in a creative way, including designs by recent and established UCF (University College Falmouth) graduates and guest artists. The cover is by Frank Chimero and you should check out his postcard too – “It’s simple. Most of the advice you’ve heard about life probably also applies to design. Not because design is life, but because both are primarily concerned with people”. Apr 01	This entry was posted in Odds & Sods by cookie. Bookmark the permalink. We have these up on the wall in our house. I particularly like ‘Always Check’ which lives on our bathroom door. Falmouth is a great place to live, we are surrounded by so many inspiring and creative people. One of my friends who studies graphics at Falmouth has launched a website (http://fromfalmouth.co.uk) to show off the work of the current 3rd year. good luck in layer tennis!